A few years ago, in another life, I was living in Madrid Spain. I was masquerading as an English teacher but it could be more accurately termed as "rent a friend" to be quite honest, as most of my English lessons I spent listening to my students problems and helping them with psychological difficulties. In turn, they listened to me too and quite often these lessons resulted in true friendships. I was a very diligent teacher, though I'm less sure about how effective I actually was, though luckily all my students were too nice to care. Having lived in Japan the year before, I was desperately craving European fun and food. One of the earliest encounters I had when I started living in Madrid was their amazing Chocolate con churros which is basically a lovely hot drink of pure molten chocolate with lovely doughnuts that are just the right shape to be dipped in. Anyway, my oldest son is a bit down in the dumps today, so I thought I would cheer him up by making my own version of the drink, though obviously adapted to the fact that I never have any ingredients in the house. 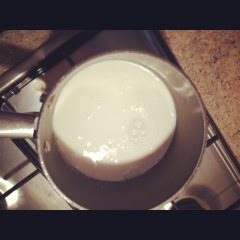 1) Heat some milk, do not burn the milk so make sure it's on a low heat. Stir in a table spoon of plain flour. 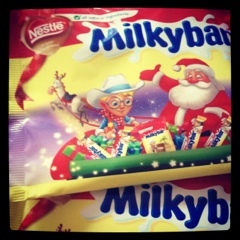 2) Ideally you should use milk chocolate, but I decided to raid the cupboard and stole the children's white chocolate packs, break it up into small pieces and stir into the milk. (use about 100g of chocolate for every 200ml of milk). 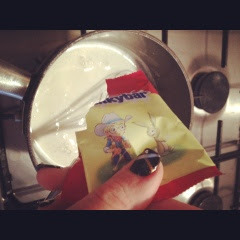 3) Whisk like mad, keep whisking until the drink has thickened sufficiently. It really needs to be as thick as possible to make it really yummy. 4) Go into the fridge and locate some chocolate coins. 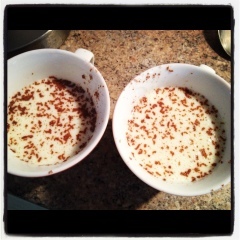 Grate them on a cheese grater to make a "cappucinoo" type effect. And there you have it! Spoon it into cool and funky cups, and prepare for great things. The end result..thick is best.